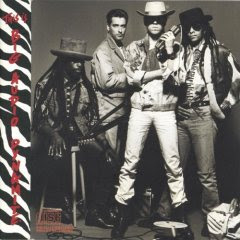 WAIST HIGH: This Is Big Audio Dynamite To Be Reissued. This Is Big Audio Dynamite To Be Reissued. Originally released 25 years ago, the debut album from Big Audio Dynamite is set to be reissued on April 26th in remastered form alongside a bonus CD containing rare remixes, outtakes, dub versions, and B-sides. This is Big Audio Dynamite - Legacy Edition commemorates the 25th anniversary of the "GROUND-BREAKING, SAMPLE-FORTIFIED" album and will also include a full-color booklet containing essays written by original band members Mick Jones, Don Letts, Dan Donovan, Leo Williams, and Greg Roberts. The bonus CD will be "especially interesting to B.A.D. aficionados as well as newcomers. The first eight tracks are alternate versions of songs following the album sequence: a 12-inch remix of 'Medicine Show,' the previously unreleased dub version of 'Sony,' a 12-inch remix of 'E=MC²' (the album's most successful single)," a previously unreleased Vocoder version outtake of "BAD," an unreleased outtake of "Electric Vandal," a 12" version of "Albert Einstein Meets The Human Beatbox," a 7" of "This Is Big Audio Dynamite," and a 12" remix of "BAD." Of the album, Don Letts had this to say in the original liner notes: "Our sound was a blend of New York beats, Jamaican bass lines, English rock'n'roll guitar and me taking care of the sampled dialogue and movie stuff. The B.A.D. philosophy was to utilise all the elements of the media to create a fuller sound and write songs that were about something. With a foot in the future and a foot in the past we were dealing with the right now."